Olympic fever, at least in my world, reached its pitch yesterday. 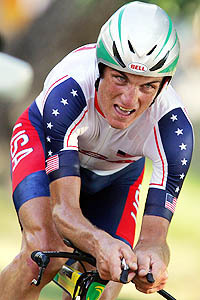 Tyler Hamilton was finally number one in pro cycling. Awarded a gold medal for the men’s individual time trial yesterday he’s back on top after withdrawing from the Tour de France (TDF) and suffering the loss of his buddy, Tugboat, his golden retriever days into the TDF. Although Tyler isn’t currently a member of the USPS team, he’s a former teammate of Lance. He’s got courage, game and he hails from my home state of Massachusetts. It should also be mentioned that the bronze was captured by fellow American Bobby Julich. Go USA. American pro cycling has never looked better! Last night having arrived home late and nursing the start of a summer cold I accompanied my Olympic viewing with a classic Greek chicken soup—avgolemono (pronounced ahv-goh-leh-MAH-noh). This is a very tasty and easy Greek soup which may be served cold or hot. Served cold, it is wonderful on a hot summer day. I prepared my soup warm as summer in San Francisco, well, that means gray, chilly and foggy days. Avgolemono is also the name for a warmed Greek sauce made with, egg yolks and lemon. It is often used to dress dolmades-stuffed grape leaves or lamb meatballs. The preparation of this dish is remarkably simple. In preparing this dish it made me think of an easy Italian soup I like to prepare, brodo con straciatella. As a point of comparison it would appear that the only difference between Greek and Italian cooking is a matter of technique and lemon juice. For this soup the whites are folded into the broth first with the lemon juice, and the yolks are added on a very low heat that mustn’t reach boiling point or it will curdle. Finally a knob of butter is floated in each bowl to serve. I started with a recipe from James Peterson’s Splendid Soups simply because this chef-author is one thorough professional. In the text of this book he writes of several well-known avgolemono variations. One from James Villas using orzo and oysters; another made with lamb broth and one more from Morocco that flavors the soup with saffron, cinnamon and uses cilantro instead of the parsley. As orzo is a Greek pantry staple I substituted the rice Peterson calls for with it. I also had some left over poached chicken that I shredded and added in at the end. As I love the fresh, clean taste of lemon I also added in some zest at the end. The following recipe was what I ended up doing. Bring first 2 ingredients to a boil in a saucepan. Cover and simmer until orzo is tender. The goal is to infuse the orzo with the chicken broth flavors while finishing the cooking of the orzo. Remove from heat. In a bowl, beat the eggs until fluffy. Add and beat in lemon juice and parsley to the eggs. Slowly stir about 2 cups of the hot broth into the egg mixture and whisk vigorously. Pour back into rest of soup over very low heat whisk until slightly thick. The soup must not come to a boil or it will curdle. Add shredded cooked chicken and lemon zest if using. Serve hot or refrigerate until cold. Garnish with lemon slice. Serve with Kalamata olives and bread for a complete meal. As an orzo novice, can I ask a dumb question? Can you further elaborate on "partially cooked orzo"? :) Thank you - this looks delicious and easy. Orzo is a essentially a pasta shaped like rice. In Italian it translates as "barley", but it's actually a small rice-shaped pasta. I prefer to cook it as the bag/box suggests and shave about 3 minutes off--this is to get more of the chicken broth flavor and not over cook the pasta. That being said you could cook the orzo in a separate pot and add it in at the end with the chicken. Is the Orzo partially cooked prior to starting the recipe when it is put in a saucepan with the broth and simmered or is that the step that partially cooks the orzo? Carol, the orzo is partially cooked on it's own prior to starting the recipe. If this is too much to deal with, you could cook the orzo to your liking al dente or otherwise and add it in while the soup and the orzo are still warm. If I may help you, it is avgo (egg) LE mo no (lemon). In my 22 years being married to a Greek, and 11 years living in Greece, I have never had it with orzo. Never. Rice, yes, orzo, no. It seems as though maybe the original recipe you have has mixed up the avgolemono SAUCE with the SOUP, both called avgolemono, but in Greece you know the difference becuase of what is being served. The sauce can be cold, but Greek soup is NEVER served cold. Traditionally, the soup is basically chicken soup (chicken, carrots, onions, olive oil, salt, Knorr, celery leaves, and a handful of rice) boiled. Then cool some broth, take the chicken out, pull the meat off the bones, discard skin and bones, add juice of 1-2 lemons to broth that has cooled, (depends upon how tart you like it), beat an egg, not just the yolk (that is for the sauce), you can use the whole egg for soup, or two, depending upon how thick you like the soup, and slowly pour the lemon/broth mixture into the egg. We often use cornstarch to thicken it. I just (ashamedly)threw the last of mine down the sink, as I make it so often my family is sick of it!! See Vefa Alexiadou's wonderful cookbook, or Nancy G's site at About.com on Greek cooking. great blog you have here. Hope you don't mind my butting in. Just wanted you to know that my Greek grandmother (yiayia), who was born in Greece, often made avgolemono soup with orzo. In fact that's the way we Greek kids grew up eating the soup, with orzo. We prefer it to rice. In my husband's horio in Greece, that's the way it is prepared, with krithirakia (orzo). Don't think you've been around many areas of Greece, even though you said you have lived there for ll years.